A wine tasting is an exciting event for me. 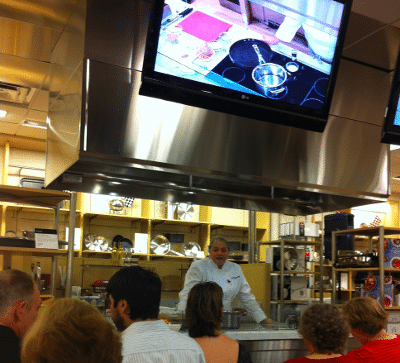 Add a cooking demonstration by a well-known chef, sampling the prepared food, and shopping = WOW! So much fun in one place. I was very excited when I won tickets from The Bluebird Patch. It was an opportunity to meet Virginia Willis IRL (in real life). I had already met her online on twitter. 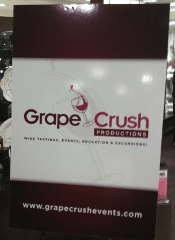 Chefs in the City is a series of events by Grape Crush Productions. 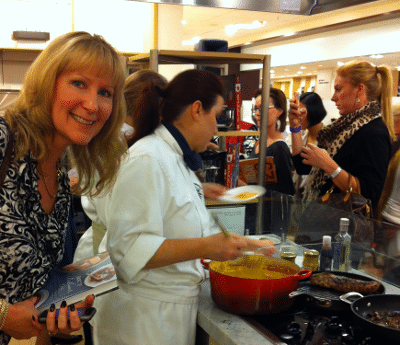 Each event features a cooking demonstration by a local chef, wine tasting, and shopping. The event is held in Bloomingdales’s home store. 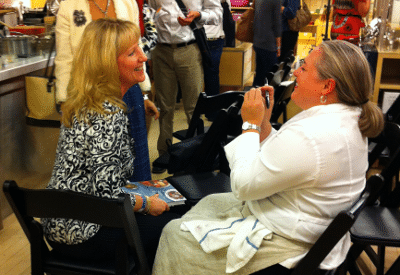 This particular event was also to promote Virginia Willis’ new cookbook Basic to Brilliant, Y-all: 150 Refined Southern Recipes and Way to Dress Them Up for Company. My favorite was the Bardolino DOC Classico. However, I must go find the Le Dog de Pierre because I just love the label and it was also a nice tasting Pinot Noir. During the tasting we shopped through the Bloomingdales’s home store. It was a great opportunity to get some early holiday shopping done or to make a wish list. 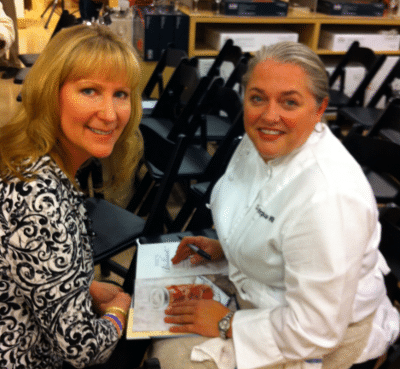 I purchased a copy of Virginia’s cookbook to have for the book signing at the end of the evening. The cooking demonstration featured 3 recipes from Virginia’s cookbook; Mushroom Ragout, Sweet Tea-Brined Pork Blade Steaks, and Sweet Potato Grits. You can really tell Virginia loves to cook and tell stories. She had a genuine smile on her face the entire time. Her knowledge of food and cooking is vast. She made everyone feel at home and answered every question from the audience. After the demo, we sampled the food Virginia had prepared. It was all so delicious! I know I will be cooking those dishes and others from her cookbook. I am particularly eyeing her Caramel Cake since I am still on my quest for the perfect one. Once we sampled her food I had to get in one of my lean-in photos by the food. My first lean-in photo is my twitter avatar and facebook profile picture with me by the dahlias. Since the first lean-in there have been several more…but that is another post yet to happen. Many thanks again to: Grape Crush Productions for bringing such a fun event to Atlanta, The Bluebird Patch for the tickets, and my friend Terry for taking photos. It was a great night filled with fun, friends, food, wine, and shopping. Cheers! sounds like an awesome event + how cool that you won tickets. looks like you had an amazing time! It was so much fun! It isn’t too often you get to walk around and shop at Bloomingdales with a glass of wine. Plus getting to meet Virginia and learn from her too. Big fan of Virginia Willis. Envious you got to meet her! But putting envy aside, I am tickled to have found another southern blogger who is interested in the same sort of things I enjoy. Have a great day!